Madison County Alabama population is roughly 334,811. Its county seat is Huntsville, Alabama. The county is named in honor of James Madison, fourth President of the United States of America, and the first to visit the state of Alabama. Madison County covers parts of the former Decatur County. Madison County is home to Monte Sano State Park, the U.S. Space & Rocket Center, and part of the Flint River. It also contains Hampton Cove Golf Course, part of the Robert Trent Jones Golf Trail. Madison County was established on December 13, 1808 by the governor of the Mississippi Territory. It is recognized as the “birthplace” of Alabama, which was founded there on December 14, 1819. For much of the county’s history, the economy revolved mainly around agriculture. This changed when a group of German rocket scientists, led by Wernher von Braun, came to Redstone Arsenal in 1950. They developed, among others, the Redstone rocket, which was modified to launch the first two Americans into space. Tens of thousands of jobs came to the area as a result of the Space Race, and the population of Madison County rose from 72,903 in 1950 to an estimated 2015 population of 353,089. Huntsville, located in the northernmost part of Alabama near the Tennessee border, is the fourth largest city in the state and the seat of Madison County. Madison is located in north-central Alabama between the Tennessee River and the Tennessee border, mostly in Madison County. In recent years, it has expanded into Limestone County. New Hope was first referred to as “Cloud’s Town” after an early family that settled in the area. In late May 1864, the town was seized by Union forces. That December, it was set afire by Union forces and largely destroyed, except for a Masonic Lodge and the post office. It was gradually rebuilt and was incorporated in 1883 as New Hope, from the name of a local Methodist church. The Gurley area was first settled in 1830, when several families bought land and established homesteads. The town is named for John Gurley, one of these early settlers. The town was known variously as Gurley’s Place in the Woods, Gurley’s, Gurleysville, or Gurley’s Water Tank (named for a water tank at the depot used for refilling the boilers on trains after the Memphis and Charleston Railroad came through the area in 1851). Owens Cross Roads, named for the Owens family of settlers, was listed on maps by 1850. A post office was established around 1861. Owens Cross Roads is in located in Madison County in northeast Alabama. Renowned equestrian painter Edward Troye (1808-1874) owned a farm at Owens Cross Roads in the early 1870s. Triana was originally incorporated on November 13, 1819 as the second town in Madison County. It purportedly was named after Rodrigo de Triana, the crewman who first sighted land while sailing with Christopher Columbus on their first voyage to the Americas. For a time in the 19th century, it was a thriving riverport on the Tennessee River prior to the construction of the railroads. Its incorporation later lapsed and it was reincorporated on July 13, 1964. Harvest is an unincorporated community and census-designated place in the northwestern part of Madison County. In the late 1800’s through early 1900’s, Harvest saw growth and development due to extension of the Fayetteville, TN rail yard along the existing Nashville, Chattanooga, and St. Louis (NC&StL) Railroad. In the early-mid 1900’s Harvest was centered around the railroad, between Capshaw and Toney, presently known as Old Railroad Bed Rd. Elder members of the Harvest community recall a significant Native American presence in the area, primarily along the railroad areas. Hazel Green is an unincorporated community and census-designated place in Madison County. The town was named Hazel Green because of the hazel bushes along the road were of a vibrant green. In the early 19th century, several farmers from Georgia and the Carolinas settled in Hazel Green after discovering that the area had some of the richest soil in the Southeast. 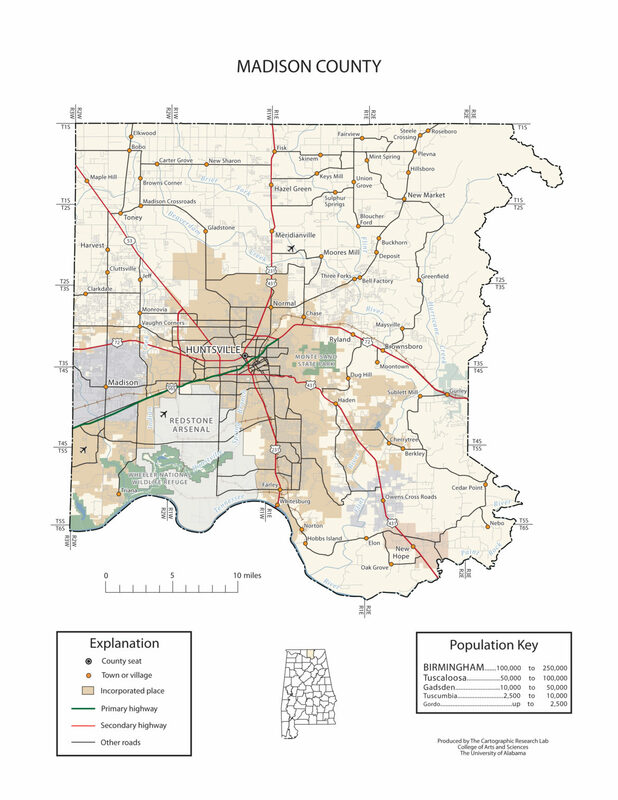 Meridianville is an unincorporated community and census-designated place in Madison County. Meridianville first appeared on the 1880 U.S. Census as an unincorporated community of 105 residents. It did not appear again on the census for a century (1980), when it was designated a census designated place (CDP). Moores Mill is a census-designated place in Madison County. New Market is a census-designated place in Madison County. In the early 19th century, several persons from Tennessee explored the area just across the border in what eventually became Madison County in Alabama. Isaac and Joseph Criner also explored the area and, in 1804, settled in the northern part near what is now called Mountain Fork of the Flint River. The original town site was owned by George Smith, who also was proprietor of the first mercantile which opened in 1819. Later settlers gave the name New Market to the community. Redstone Arsenal (RSA) is a United States Army post and a census-designated place (CDP) adjacent to Huntsville in Madison County. The Arsenal is a garrison for a number of tenants including the United States Army Material Command, Army’s Aviation and Missile Command, the Missile Defense Agency of the Department of Defense, and NASA’s Marshall Space Flight Center. Toney is an unincorporated community in the northwestern part of Madison County.